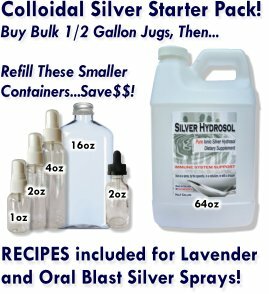 I read about colloidal silver hydrosol from Dr. Leonard Coldwell's book. I have low cortisol levels in the morning and early afternoon and a low SIgA-poor immune function. Consequently, I have fought sinusitis and other illnesses for 3 decades. I always have fatigue and fight flu symptoms every winter. Since I have been using the colloidal silver this past winter, I have not gotten the flu. All my friends and family had the flu except me. My sinuses are 90% better and I've had so much more energy. I have not been to the doctor for any sickness, flu or sinusitus-no antibiotics! The silver has definitely helped my health and I do not plan on living without it again! Just wished I knew about this sooner. I'm sold!! Thank you for this outstanding testimonial regarding colloidal silver hydrosol as a tool for health! And I agree, I wish I had learned about this sooner too! Recently, I’ve come across Dr. Raymond Francis on YouTube and I love the simplicity of his views on health. Simply put, disease is caused either by not enough nutrients for all the cells in the body or toxins interfering with cell life or a combination of both. I personally regard silver as a vital micronutrient and this fits well with Dr. Francis’s model. Get the body what it needs and health is automatic...that’s this take and I agree and try to live that way. But it’s hard because who can test all the liquids and foods one eats for nutrient value and toxicity? No one. That’s why I love testimonials! When someone clearly identifies a benefit of something and shares that information, that is the proof needed to know that someone good is here. In fact, it was my own profound experience with colloidal silver hydrosol that led to me creating and marketing my own brand here. All the products we have are ones that I have my own testimonial for. Thanks again and please remind me when you place your next order? I would like to include some extras for you as my thanks for taking the time to share your story with us!